Today we will learn about types of springs in mechanical used for various purposes. 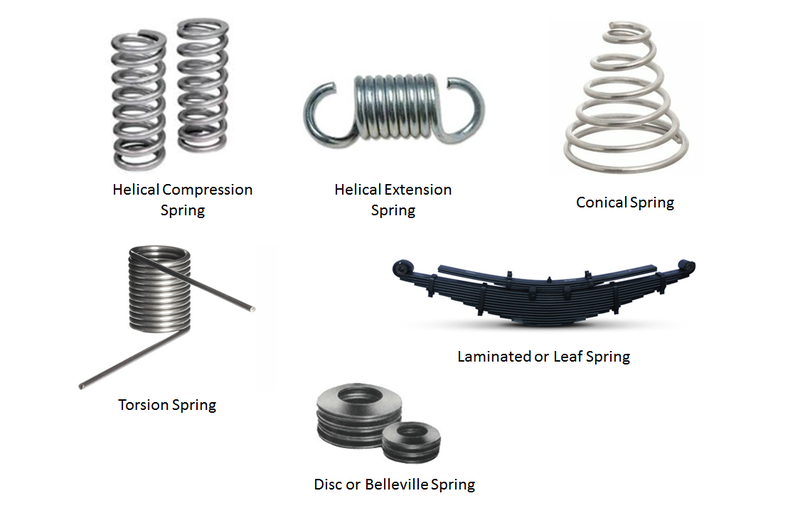 Spring is an elastic machine element that can deflect under the application of load. When the load is removed, it regains its original position. In other words, spring is a mechanical object made up of material having very high yield strength to restore elastic. It is used in various machines to absorb shocks or it also resist to transfer shocks and vibrations on various critical machine members. Springs are a very useful machine element. There are various regions to use spring. Some of them are given below. It is the most commonly used Mechanical springs. In this type of spring a coil is wrapped in such a way that it resemble like a thread. This type of springs is used for carrying Compression, Extension, and Torque forces. According to the loading condition helical springs are classified into following four types. These springs are open coil helical spring. A helical coil is pressed or squeezes by load. It resists compressive or push forces. It also shows resistance to linear compressive forces. Sometimes fluid behave as compression springs such as fluid pressure systems. In this type of spring the load applied to coil is a torque or twisting force. In other words, Helical springs which can hold and release angular energy. Or these springs try to hold a system in place. After twisting, the helical coil applies proportional force to opposite direction. The torsion springs are used in application which rotates Less than 360 degree. These springs have either clockwise or antilock wise rotation. Leaf springs are also called as s semi- elliptical spring or Cart spring. It is one of the oldest forms of springs. Leaf springs are long and flat slender arc -shaped. These types of springs are used In Vehicle suspensions. Location for axel is center of the arc. And either end of loop is attached to the vehicle. It spread the load over vehicle chassis. Leaf springs are easy to construct. No need for separate linkage to hold the axle in position, leaf springs work as a linkage. Rear axle location helps in reducing the extra weight. Axle damping is control by leaf springs. It reduces cost by eliminating the need of trailing arm and pan hard rod. A Belleville springs also known as a coned-disc spring, conical spring washer, disc spring, Belleville washer or cupped spring washer. Belleville washers are mostly coin shape spring with a hole in center. 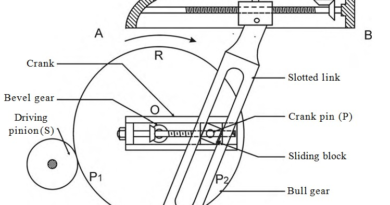 This disc springs are dynamically or statically loaded to its axis. This spring required less space for installation but can bear a very large load. These springs have more advantages compare to other springs. These springs are conical shape compression springs. Conical springs are also known as tapered spring. These springs used to provide stability and reduce solid height. As the name suggest this springs are made for special purpose use. Special purpose springs are made up from different types of material all together such as Air and water. This is all about the types of springs. If you have any query regarding this article, ask by commenting. If you like this article, don’t forget to share it on social network. Subscribe our website for more informative articles. Thanks for reading it.